In the western Atlantic Ocean, Caribbean and Gulf of Mexico the lionfish is a non-native invasive species without natural predators or any natural mechanism for controlling their population. They are the perfect predator with voracious appetites; scientific studies have proven that a lionfish can reduce the numbers of small fish, juveniles and babies, young lobsters, shrimps, etc. by 80% within 5 weeks of establishing its territory. These are the same fish and other marine life that are important for the health and sustainability of the reefs and corals by keeping them clean and productive. The reefs provide shelter to baby fish who grow up and are an important part of the commercial and recreational fisheries upon which many, many people’s livelihoods (and lives) depend, too! Some isolated fishing communities in Latin America would literally starve if their local fish population crashed and the Florida commercial lobster industry is already being decimated. You can only very RARELY catch a lionfish on a hook and line, you cannot use a net to catch them or trawl for them because of the terrain in which they live, so spearing is really the only viable option for harvesting the fish. Lionfish, however, can stay far outside of the reach of “spearos” because they are found in depths as far down as 600 feet… some say as far down as 900 feet! Lionfish can now be found along the coast of the United States as far north as Rhode Island and as far south as Brazil and every body of water in between. Honestly, we have NO IDEA just how bad the problem is because there are VAST stretches of coastline in Latin America that are virtually uninhabited and not accessible to divers. In short, lionfish do not belong in this part of the world, they are eating everything they can their mouths on, spreading faster than a plaque of locusts and, consequently, destroying the ecosystems and reefs in which they live. 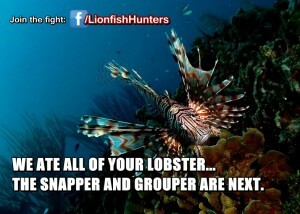 So we hunt lionfish. Some of us hunt them for sport, some of us hunt them for food and some of us hunt them to protect our way of life… but we all are doing the very best we can to make a difference in our own way. Do you want to learn how to hunt lionfish with hands on training from the experts? Contact the non-profit group Ennds.org to find out when their next training dives are being held. Hi Scott. I am a dive master and I went to Jamaica last week and I finally got a group of divers together to hunt some lionfish for dinner. First of all it was fun and so easy compared to the spearfishing I do up in the north Atlantic around Atlantic City NJ. They are so docile. They don’t duck or run for cover. They just sit there and let you spear them. Even if I miss, they may move 18″ but they are still waiting for me to catch so I can put them on my plate for dinner. As for the taste. It was the best fish I have ever had. I am an 8th Grade student in Gifft Hill School. Here in the US Virgin Islands there are many lion fish. Right now in my class I am writing a research paper and after i read your article i had further understanding of why we actually hunt lion fish. But to give credit to your work i need the date of when you published “why we hunt lionfish”. This article was published 23 January 2013.
thank you very much Scott. In my school my science teacher is in the organization “CORE” and we are going out to hunt the lion fish on the Virgin Island reefs.!.! Moray eels (family Muraenidae), bluespotted cornetfish (Fistularia commersonii), and large groupers, like the tiger grouper (Mycteroperca tigris) and Nassau grouper (Epinephelus striatus),are all natural predators that can be introduced into the affected environment to help deal with the outbreak of lionfish. Good info! Do sharks like Tigers and bull sharks eat lion fish? Also where could I buy lion fish fillets to try at home? Don’t divers need to be careful since they are poisonous? 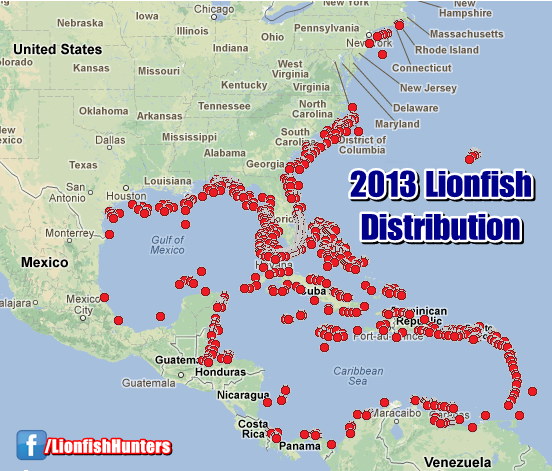 What is the bag limit for Lionfish in Florida? there’s a much worse, more destructive, and non-native predator that is causing much more damage to the sea life than lionfish ever could.